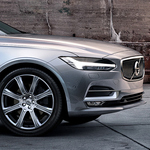 The Volvo V90 is a luxury wagon that we at Montrose Volvo of Cleveland recommend for people who want a versatile luxury vehicle. The Volvo V90 is a great car for getting groceries, commuting, or going out of town. If you like luxury vehicles with impressive performance features, the V90 is a vehicle that you might appreciate. The Volvo V90 has electrical power steering personalization. You can adjust the level of steering help based on what makes you comfortable. If you don't adjust it, it is automatic based on the speeds you drive. The ability to adjust steering comfort allows drivers to feel great with the performance of the V90. Start/Stop technology is integrated into the V90 so you can aid in putting fewer emissions in the air while your car idles. When you stop at a red light, your car will shut off and then resume as you drive. This performance feature saves gas and helps protect air quality.